Parliamentary cooperation is one of the effective channels to boost the multifaceted cooperation between Vietnam and Morocco, said the heads of the legislative bodies of the two countries at their talks in Hanoi on December 18. 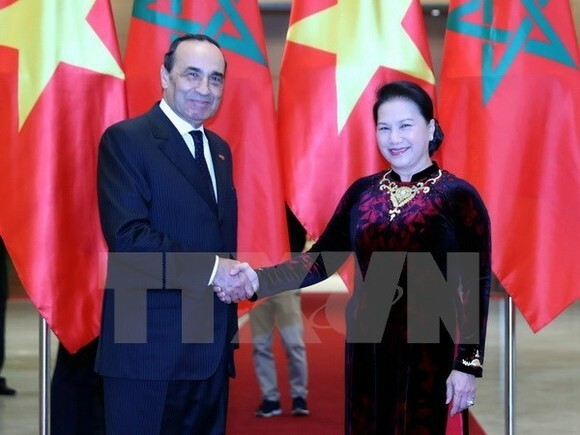 Chairwoman of the National Assembly of Vietnam Nguyen Thi Kim Ngan and President of the Moroccan House of Representatives Habib El Malki held talks after a welcome ceremony for the Moroccan top legislator, who makes an official visit to Vietnam from December 16-22. The host and guest expressed their pleasure at the growing relations between the two legislatures thanks to exchange of visit as well as regular meetings, consultations and mutual support at multilateral forums such as the Inter-Parliamentary Union (IPU) and the Parliamentary Assembly of Francophonie (APF). They agreed to step up high-level delegation exchanges to increase mutual understanding and trust as well as strengthen coordination at the aforesaid multilateral forums. 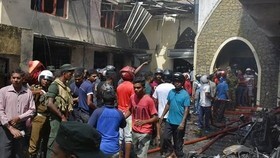 The two sides will coordinate to monitor the implementation of agreements signed between the two countries’ governments and ministries for mutual benefits. The two parliamentary leaders noted that economic and trade ties are still modest, with bilateral trade at only US$ 190 million in 2016, and vowed to further promote those ties. Chairwoman Ngan affirmed that Vietnam attaches much importance to developing friendship and multidimensional cooperation with African countries, of which Morocco is a priority partner in North Africa. She congratulated Morocco for coming back to the African Union and hoped the country will support the development of relations between Vietnam and the union. The National Assembly of Vietnam supports the enhancement of multifaceted cooperation with Morocco via refining the legal system and creating a favourable legal framework for Moroccan businesses, she noted. 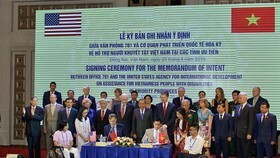 The NA Chairwoman recommended forging connectivity between the two countries’ businesses in such potential fields as trade, tourism, finance, and renewable energy, looking toward the establishment of a joint business council. 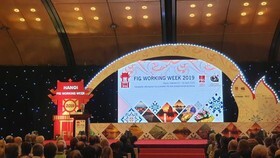 Vietnam and Morocco need to step up trade promotion activities, increase business delegation exchanges at international workshops, forums and trade fairs while tapping cooperation potential in agriculture, mining, construction material, chemicals, garment-textile, footwear, and food processing, Ngan said. She suggested that the two sides should establish direct payment ties between their commercial banks and use the Moroccan banking network in Africa to support business activities, including payment, for Vietnamese firms in the region. 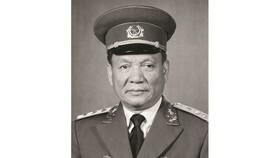 Ngan took this occasion to thank the Moroccan Government and House of Representative for facilitating the settlement and integration of the Vietnamese community in the African country, adding that the overseas Vietnamese will continue to be an important factor to tighten the bilateral friendship and promote two-way trade. 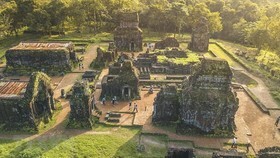 For his part, the Moroccan parliament leader described Vietnam as a dynamic and future-oriented country, noting that he wants to study the Southeast Asian country’s history and culture to boost bilateral cooperation in the fields. 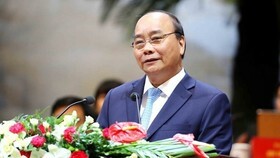 He congratulated Vietnam on the successful organisation of the APEC Economic Leaders’ Week in Da Nang in November and described Vietnam as a gateway to connect Morocco with the Association of Southeast Asian Nations (ASEAN). Vice versa Morocco is ready to link Vietnam with Africa, he said, adding that the two sides should work together to build cooperation strategies to make use of these advantages. Vietnam and Morocco have shared common principles and values in external policies, which are protecting and promoting peace, security and prosperity of nations, Malki said. He stressed that Morocco supports Vietnam’s stance on addressing all disputes via peaceful dialogues. 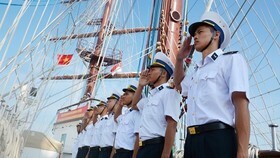 Regarding the East Sea issue, Chairwoman Ngan reiterated Vietnam’s consistent policy of settling sovereignty and territory disputes peacefully on the basis of respecting international law, including the 1982 UN Convention on the Law of the Sea (UNCLOS). She told the guest that Vietnam has preserved a Moroccan-style village gate in Hanoi, which was constructed in 1956-1960 by Moroccan soldiers who joined the League for the Independence of Vietnam (Viet Minh) in the resistance war against France, saying that the work demonstrates the solidarity and cooperation between the two countries. Ngan accepted the invitation of the Morocco’s President of House of Representatives to pay an official visit to the country in an early time. After talks, the two sides signed a cooperation agreement between Vietnam’s National Assembly and Morocco’s House of Representatives. 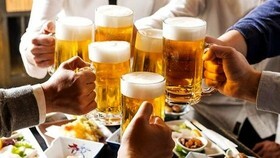 They later informed the outcomes of their talks to the press. 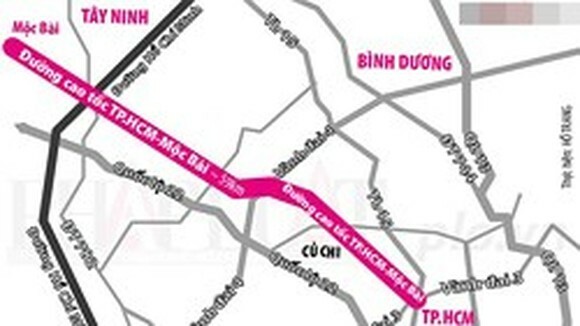 The same day, Chairwoman Ngan is scheduled to host a banquet for the guest and his spouse.